Another Friday, another Five Minute Friday. Now, set your timer, clear your head, for five minutes of free writing without worrying about getting it right. 1. Write for 5 minutes flat – no editing, no over thinking, no backtracking. (On your own blog or in the comments here). The writing prompt this week is LOST. Amazing Grace, how sweet the sound, That saved a wretch like me....I once was lost but now am found,Was blind, but now, I see. But today I'm thinking of the Parable of the Lost Sheep, told in Luke 15. What man of you, having a hundred sheep, if he has lost one of them, does not leave the ninety-nine in the open country, and go after the one that is lost, until he finds it? 5 And when he has found it, he lays it on his shoulders, rejoicing. 6 And when he comes home, he calls together his friends and his neighbors, saying to them, ‘Rejoice with me, for I have found my sheep that was lost.’ 7 Just so, I tell you, there will be more joy in heaven over one sinner who repents than over ninety-nine righteous persons who need no repentance. I was away from the church, away from the Lord, for about 15 years in my early adulthood. Actually, I never knew Him in a personal way before that, but I was going to church. I was in total rebellion. And I mean Rebellion, with a capital R. A (then-) friend and I used to joke that we would burn in hell for the things we were doing. 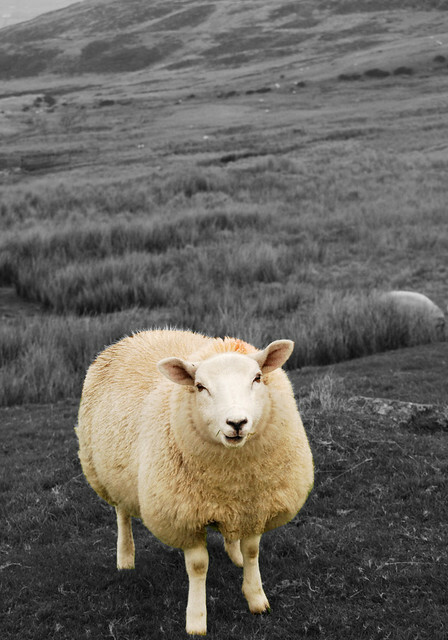 I've heard that sheep are stupid, and I guess for people that equates to being foolish. I certainly was. During that time, I realize that God was calling me, but I wasn't listening. A coworker said she was praying for me. I thought, "That's nice" but didn't give it a second thought. My former church sent a letter to say that they were dropping me from the rolls unless I started attending. I set the envelope by my keyboard and thought about it, but never followed up. Then, during a season in which I was unsure of many things, I finally heard His voice. He found His lost sheep. Now I can only imagine the rejoicing, the joy in heaven, when that happened. My life has changed, and all I had to do was stop running away and listen. Isn't it incredible that HE seeks US? Now it's your turn! Write your five minutes' worth in the comments (here or on Lisa-Jo's blog), or write your own post and link up. Click the FMF link at the top of the page to get to Lisa-Jo's home on the web. Thank you for sharing! I too wondered away for a while and I am so thankful He took me back in His arms when I returned. What an awesome God we serve! Hi, I'm your neighbor at 5minfri. What a beautifully told testimony. We are all sheep! So glad that you listened for His persistent calling! And we would all burn in hell without our acceptance His sacrifice and redemption for each one of us. Beautiful sweet story of redemption. Except for the part where you were dropped from church. What a sad way on non ministering. I know that happens but I wish churches would think of a better way. I am glad our Father had a better way. Patiently waiting for you to be found. Thank you for visiting me and offering a prayer for Denise and Eddie. You post and comment blesses me. I am following you now. Have a great weekend. Thanks for sharing your testimony. It is great to know the Lord still deals with each sheep, even as we are being rebellious. I'm so glad you found your way back!